Wobbleyou is presented by a friendly bunch who want nothing more than you to achieve your health and fitness aspirations in a sociable and relaxed environment. 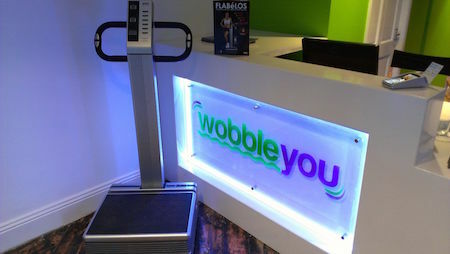 Social Circle are please to bring you Greater Manchester's only Wobbleyou Fitness Session. Hate the gym? Don't have time to exercise? Looking for a quick and easy way to stay in shape? Look no further...! They are the only studio in Greater Manchester dedicated to the use of technology known as 'FLABéLOS'; best described as a 'whole body vibration workout'. With FLABéLOS you can get the benefits of a one hour gym session in just a 10 minute 'wobble' - the most strenuous thing you need to do is take off your shoes! Benefits of regular ‘wobbling’ include inch loss & toning, reduced cellulite, minimised lower back pain, improved circulation, increased metabolism and anti-aging effects. Just quote 'Social Circle' at their Northern Quarter studio to claim your free session.